Pest description and crop damage The bean aphid is dark olive green to black with light-color legs. It is usually more of an early-year pest. The melon aphid is variable in color but is often light green mottled with dark green. 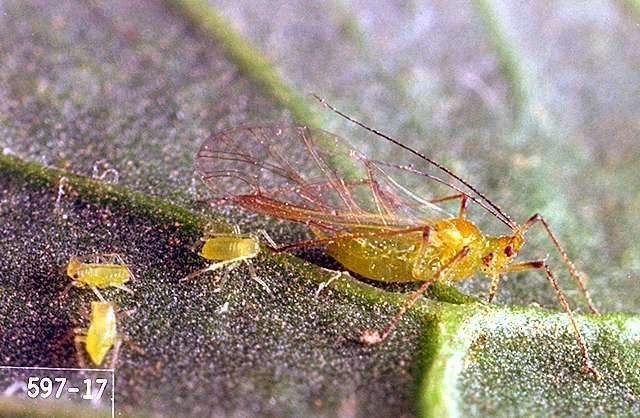 Unlike other aphids, it is able to tolerate hot weather. The potato aphid has both a pink and green form. It is a larger aphid. High potato aphid populations can distort leaves and stems, stunt plants, and cause necrotic spots on leaves. These aphids also secrete a large amount of honeydew that promotes development of sooty mold on foliage and fruit. Aphids damage plants by sucking plant sap, which causes heavily infested leaves to curl and stunts plants; excreting honeydew, which causes sticky, shiny leaves to turn black because of a sooty-mold fungus growth; and spreading plant diseases (a large number of viruses are spread by aphids). Infestations frequently are localized; heavily infested leaves curl down. malathion-Do not use on wet or damp foliage. acetamiprid (Assail 30SG) 0.047 to 0.075 lb ai/a. PHI 0 days. REI 12 hr. Retreatment interval 5 days. Do not exceed 5 applications or 0.5 lb ai/a per season. azadirachtin (Neemix)-PHI 0 days. REI 4 hr. See label for rates. Acts slowly; apply early. Thorough coverage and repeated applications are necessary. bifenthrin (Brigade WSB) at 0.05 to 0.1 lb ai/a. PHI 3 days. REI 12 hr. Do not exceed 0.3 lb ai/a per season. Do not make more than two applications after bloom. Retreatment interval 7 days. clothianidin (Belay) at 0.05 to 0.067 lb ai/a foliar; 0.15 to 0.2 lb ai/a soil. PHI 7 days foliar, 21 days soil. REI 12 hr. Retreatment interval 10 days. Do not exceed 0.2 lb ai/a per season. dinotefuran (Scorpion 35SL) at 0.05 to 0.18 lb ai/a foliar or 0.23 to 0.27 lb ai/a soil. PHI 1 day (foliar), 21 days (soil). REI 12 hr. Do not exceed per season 0.266 lb ai/a foliar or 0.532 lb ai/a soil. Retreatment interval 7 days. flupyradifurone (Sivanto 200SL) at 0.14 to 0.18 lb ai/a foliar; 0.27 to 0.37 lb ai/a soil. PHI 1 day foliar; 21 days soil. REI 4 hr. Retreatment interval 7 days. Do not exceed 0.365 lb ai/a per season. imidacloprid (Admire Pro) at 0.25 to 0.38 lb ai/a soil or 0.016 lb ai/10,000 plants for planthouse. PHI 21 days. REI 12 hr. Do not exceed 0.38 lb ai/a per soil application. Do not exceed 0.0156 lb ai/10,000 plants. Limit 1 planthouse treatment. malathion (Fyfanon 8) at 1 lb ai/a pumpkin and winter squash; 1.75 lb ai/a summer squash. PHI 1 day. REI 12 hr for pumpkin and winter squash and 24 hr for summer squash. Retreatment interval 7 days. Limit 2 treatments pumpkins and 3 treatments squash per year. naled (Dibrom 8) at 0.94 to 1.9 lb ai/a. PHI 1 day. REI 48. Retreatment interval 7 days. Limit 5 treatments per year. Do not exceed 5.6 lb ai/a per season. Summer squash only. oxamyl (Vydate L) at 0.5 to 1 lb ai/a foliar. PHI 1 day. REI 48 hr. Retreatment interval 7 days. Do not exceed 4 lb ai/a per season. permethrin (Permethrin) 0.2 lb ai/a. PHI 0 days. REI 12 hr. Retreatment interval 7 days. Do not exceed 1.2 lb ai/a per season. pymetrozine (Fulfill) at 0.086 lb ai/a. PHI 0 days. REI 12 hr. Retreatment interval 7 days. Two applications may be needed for persistent populations. 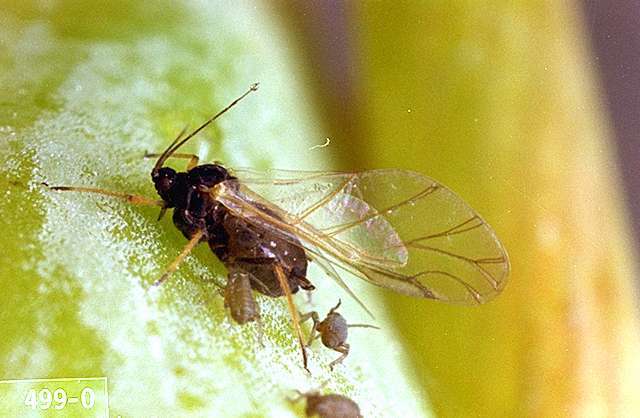 Aphids stop feeding soon after treatment but may remain on plants 4 to 10 days, until they die. Do not exceed 0.172 lb ai/a per season. tebuconazole/lambda cyhalothrin (Crossover) at 0.16 lb ai/a. PHI 7 days. REI 24 hr. Retreatment interval 10 days. Do not exceed 0.48 lb ai/a tebuconazole and 0.18 lb ai/a lambda cyhalothrin. thiamethoxam (Actara) at 0.023 to 0.047 lb ai/a. PHI 0 days. REI 12 hr. Retreatment interval 5 days. Do not exceed 0.172 lb ai/a per season. thiamethoxam (Platinum) at 0.078 to 0.172 lb ai/a soil. PHI 30 days. REI 12 hr. Do not exceed 0.172 lb ai/a per season. See label for recommended in-row application instructions.